Norman Rockwell (1894-1978), Boy with Baby Carriage, 1916. Oil on canvas, 20 3/4" x 18 5/8". Cover illustration for The Saturday Evening Post, May 20, 1916. Norman Rockwell Museum Collections. All rights reserved. 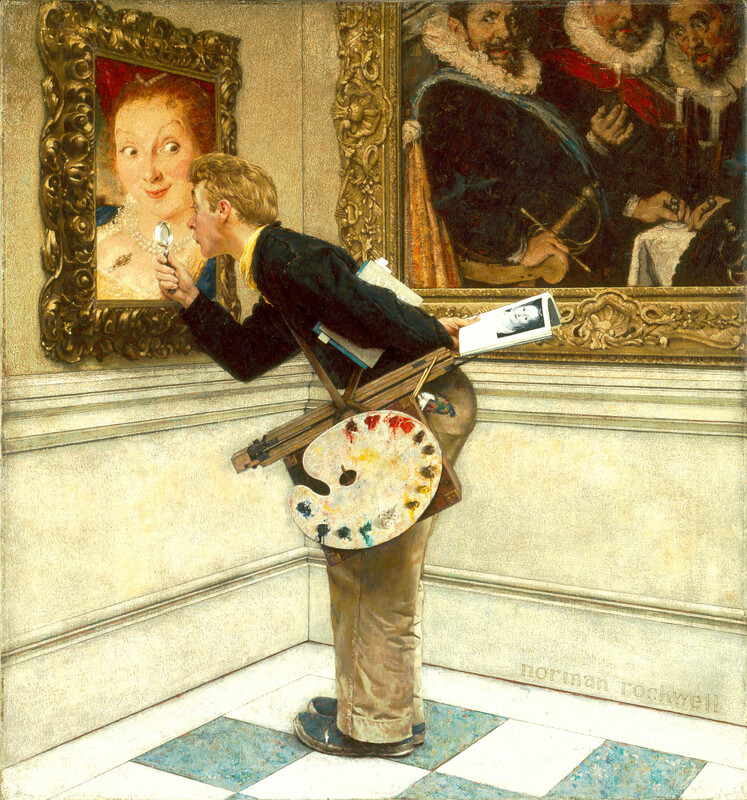 Norman Rockwell always wanted to be an artist. 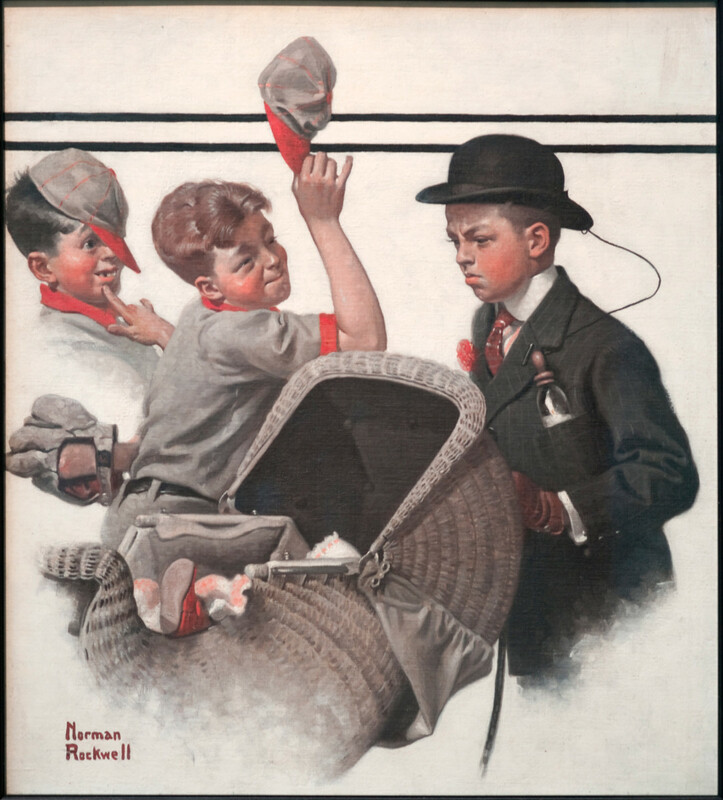 Finding success early as artist/art editor for the Boy Scouts’ Boy’s Life magazine, Rockwell was also set on becoming a cover artist for The Saturday Evening Post, which was then considered the premier showcase for an illustrator’s work. Without an appointment, the artist boarded a train to the Post’s headquarters in Philadelphia in 1916, with a portfolio containing two paintings and a sketch idea for potential covers—the editors liked what they saw, purchasing the two paintings for $75, and telling Rockwell to go ahead with his sketch idea. The artist was thrilled. Boy with Baby Carriage was one of the paintings that landed Rockwell the job, and became his first Post cover on May 20, 1916. Painted in artist Frederic Remington’s former New Rochelle, NY studio (which Rockwell and friend/cartoonist Clyde Forysthe rented early in their careers), the humorous illustration was typical of Rockwell’s childhood-themed images of the time. Billy Paine, one of Rockwell’s favorite early models, posed for all three boys pictured in the painting, earning approximately 25 cents an hour. Although Rockwell’s career with The Saturday Evening Post lasted nearly 50 years, resulting in 321 original covers that made him a household name, the artist never forgot his first big break from the Boy Scouts; he created yearly calendars for the Scouts throughout his entire career. View all of Norman Rockwell’s original Saturday Evening Post cover tearsheets, created between 1916 and 1963, currently on exhibit at Norman Rockwell Museum. Wanting to support the United States during World War II, and inspired by Franklin Delano Roosevelt’s January 1941 address to Congress, Norman Rockwell sought to illustrate the President’s vision for a postwar world founded on four basic human freedoms: freedom of speech, freedom of religion, freedom from want, and freedom from fear. Finding new ideas for paintings never came easy, but the high concept became an even greater challenge for Rockwell. 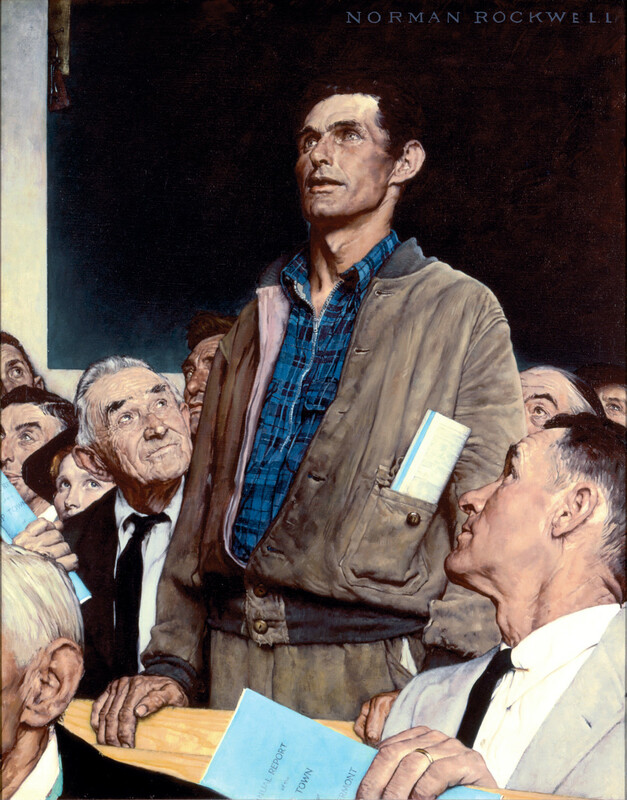 By chance, the artist attended a town meeting near his home in Arlington, VT, where one man rose among his neighbors to voice an unpopular view—that night, Rockwell awoke with the realization that presenting the freedoms from the perspective of his own hometown experiences could prove quite effective. Rockwell made some rough sketches and went to Washington to propose his poster idea, but the Ordnance Department of the U.S. Army did not have additional resources for the commission. 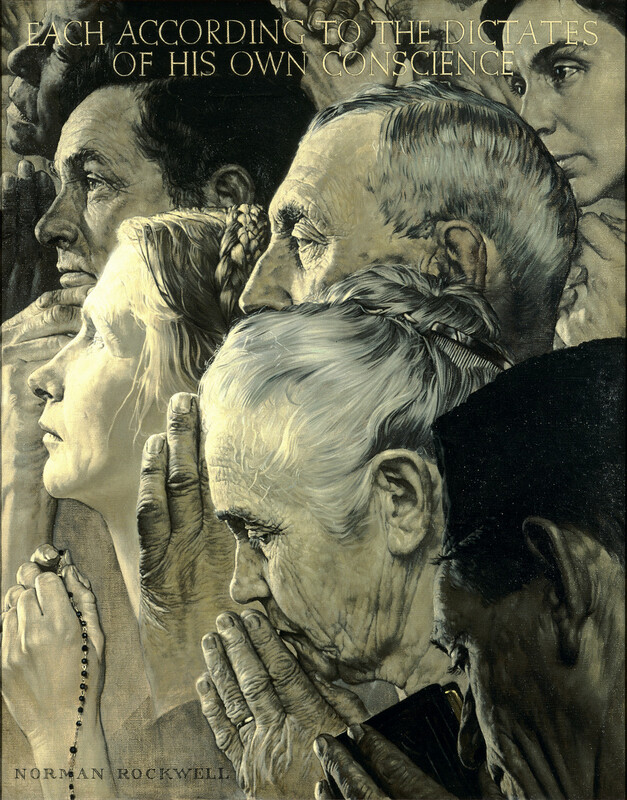 On his way back to Vermont, Rockwell stopped at the Philadelphia office of Ben Hibbs, editor of The Saturday Evening Post, and showed him the proposed sketches for The Four Freedoms—Hibbs immediately made plans to use the illustrations in the Post. It took several months before Rockwell even began the project, as he still struggled with how to execute the concept. 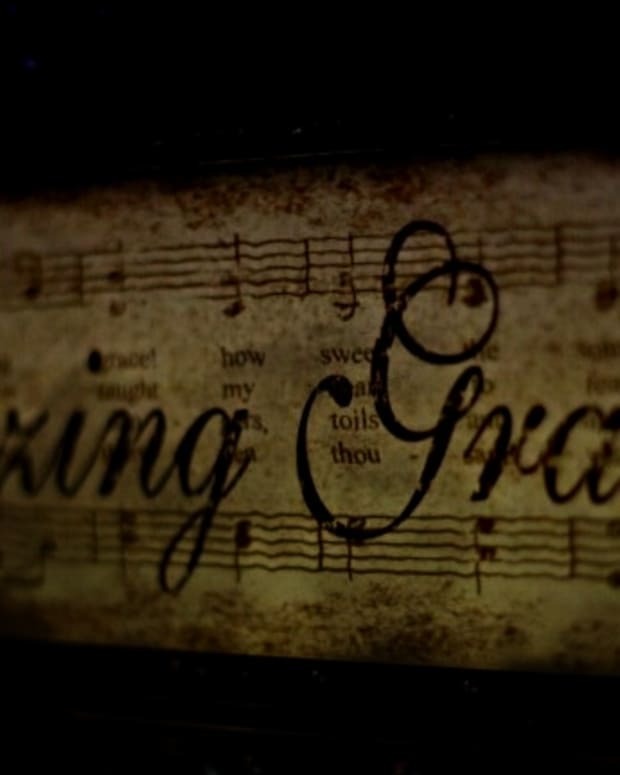 Always portraying the man speaking out at the town hall meeting, Freedom of Speech started out with a much different composition; and Freedom of Worship originally was set in a barbershop with patrons of a variety of different faiths. Upon final completion of the four paintings, the artist was exhausted and doubted the concept of his Thanksgiving-themed Freedom From Want. 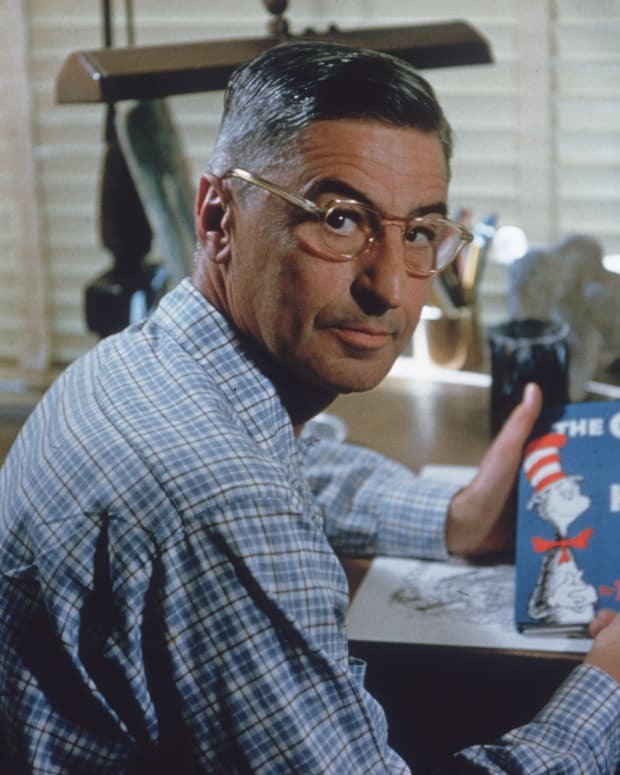 Running in four consecutive issues of The Saturday Evening Post, starting in February 1943, the paintings were a phenomenal success. 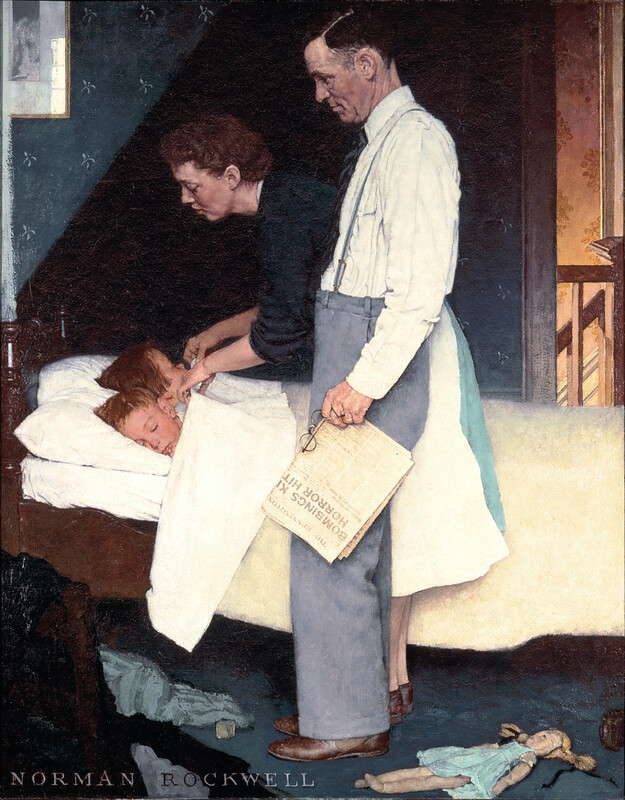 In May of the same year, representatives from the Post and U.S. Department of the Treasury announced a joint campaign to sell war bonds and stamps—the original paintings were sent on a national tour, visited by more than a million people, who purchased $133 million worth of war bonds and stamps. 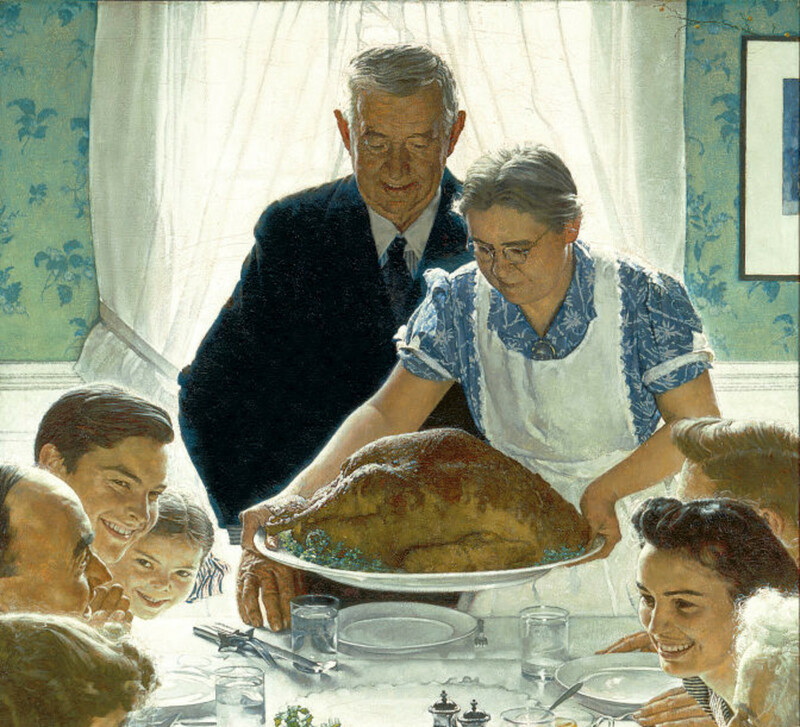 Considered part of Norman Rockwell’s most important works, The Four Freedoms continue to inspire people of all ages (Rockwell fan/art collector Steven Spielberg even recreated the image of Freedom From Fear for a scene in his 1987 movie, Empire of the Sun). Part of the permanent collection of Norman Rockwell Museum, the paintings have their own gallery created specifically for their display, inviting a space of quiet reflection for visitors. A popular, recurring subject in Norman Rockwell’s work are images commenting on the practice of both creating and appreciating art itself. For 1955’s Art Critic, Rockwell posed his son Jarvis, as a young artist intensely examining gallery artworks that, unbeknownst to him, are staring back at him—blurring the line of fantasy and reality. An incredibly thorough and detailed artist, Rockwell went through dozens of sketches and drawings to figure out the composition, considering variations of Dutch portraits and landscapes for the artwork examined, before arriving on displays of a Peter Paul Rubens-inspired portrait (modeled for by his wife, Mary) and a group of Dutch cavaliers. On the student’s palette, Rockwell placed a three-dimensional dollop of paint, to remind us that we too are standing in a gallery looking at a painting. 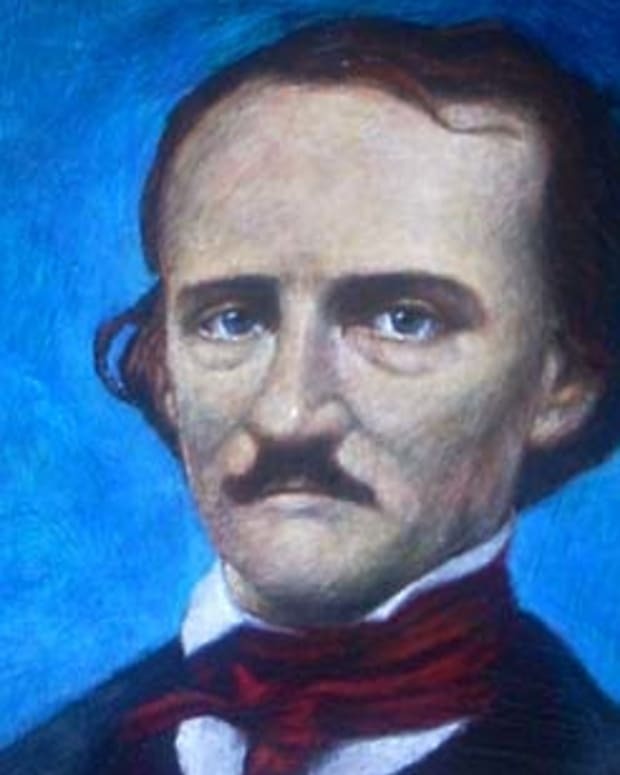 The artist’s son, Jarvis Rockwell, went on to have a successful career as an artist in his own right, creating more abstract, contemporary artwork. Maya, a Hindu-inspired pyramid, utilizing his large collection of toy action figures, was displayed as part of a career retrospective of the artist’s work at Norman Rockwell Museum in the summer of 2013. 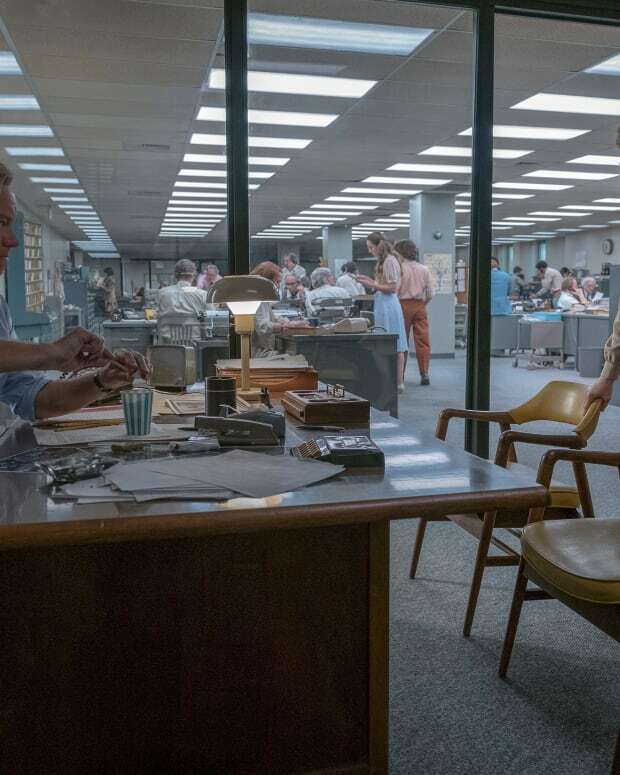 In the 1960s, the mood in America was shifting. 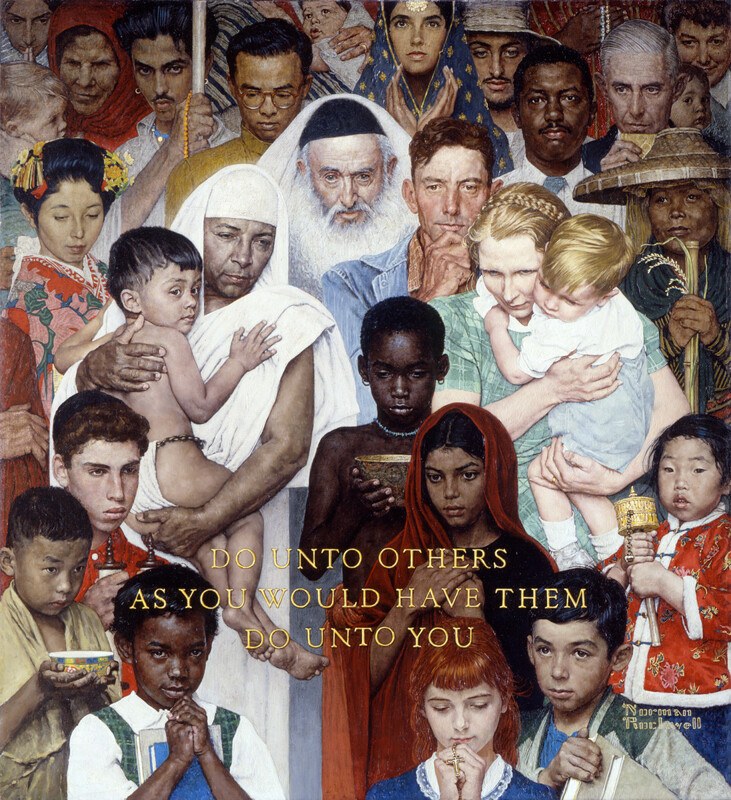 Once restricted from showing minorities on the cover of the Post, Norman Rockwell’s 1961 painting, Golden Rule featured a gathering of men, women, and children of different races, religions, and ethnicities, with the simple but universal phrase: “Do Unto Others as You Would Have Them Do Unto You.” In 1985, Rockwell’s iconic illustration was reimagined as a giant mosaic, and gifted to the United Nations on behalf of the United States by First Lady Nancy Reagan—it has remained on display, since that time, in the UN’s New York City Headquarters. Norman Rockwell Museum&apos;s traveling exhibition, “American Chronicles: The Art of Norman Rockwell” will be on view at Italy’s Fondiazone Roma Museuo through February 8, 2015. Coincidentally, Golden Rule began life as a drawing inspired by the UN’s humanitarian mission. Conceived in 1952 and executed in 1953, the original illustration featured 65 people representing the world’s nations, surrounding key members of the UN Security Council (USSR, UK and U.S.). The idea was to express hope in the new peacekeeping organization, and Rockwell conducted extensive research, including the photographing of the diplomats and models pictured. After completing the drawing, the artist lost faith and abandoned the project, feeling he was out of his depth. After moving to Stockbridge, Massachusetts, Rockwell revisited the idea a decade later, removing the diplomats and focusing on the idea of common humanity, to create one of his most enduring portraits. To celebrate the 70 anniversary of the United Nations, Norman Rockwell Museum is collaborating with the United Nations for a special exhibition of the process and artwork behind Golden Rule, to be displayed at the UN’s New York Visitor Centre from June 2015 to January 2016. Norman Rockwell (1894-1978), Stockbridge Mainstreet at Christmas (Home for Christmas), 1967. Oil on canvas, 26 ½" x 95 ½". McCalls, December 1967. Norman Rockwell Museum Collections. ©Norman Rockwell Family Agency. All rights reserved. Norman Rockwell’s affectionate portrait of his hometown (and home of Norman Rockwell Museum) has come to symbolize the holiday season. The artist began work on the seasonal landscape painting, after moving to the New England town in the mid-1950s—pictured are his original studio (illuminated with a Christmas tree in its second floor window), town hall (which served as a backdrop for his 1955 painting, Marriage License), and the Red Lion Inn, one of the oldest inns in the country. Working on the painting between other assignments, Rockwell finally finished the painting for McCall’s magazine in the late 1960s, perhaps explaining the transition from 1950s-era cars lining the street, to more modern automobiles entering and leaving from either side. On the far right of the painting, the viewer can see Rockwell’s South Street home, and studio, converted from an old, red carriage barn. 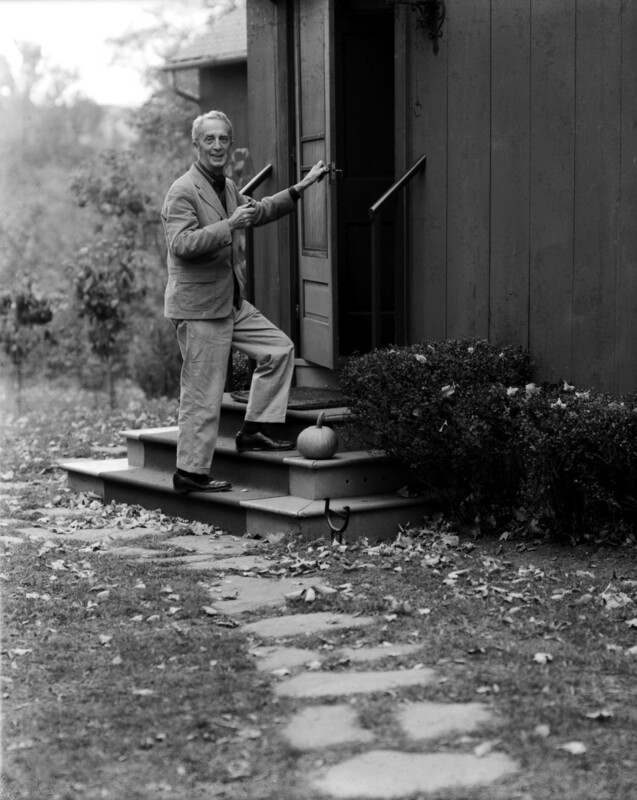 Norman Rockwell entering the South Street, Stockbridge, Massachusetts, studio, 1966. Photo by Louie Lamone (1918-2007). ©Norman Rockwell Family Agency. All rights reserved. Living in Stockbridge for the last 25 years of his life, Rockwell once referred to Stockbridge as “the best of New England, the best of America.” In 1969, the artist lended several of his works to help preserve an old historic building, The Old Corner House (pictured on the far left of the Main Street painting)—in just a few years, thousands of appreciative fans began to visit Stockbridge to view Rockwell’s original art, and Norman Rockwell Museum was born. 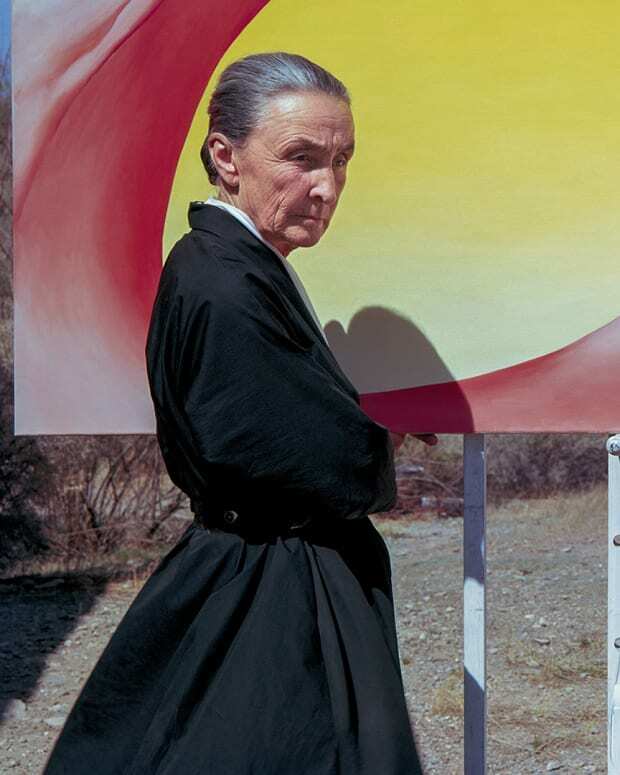 Moved to its current location in town in 1993, the Museum houses the world’s largest collection of artwork by Norman Rockwell, as well as his original Stockbridge studio, on a beautiful 36-acre campus, with inspiring views of the Berkshires. An added bonus: every first December the town of Stockbridge recreates the artist’s Main Street painting in time for the holidays.